"Best Books of the Month "
Save 40% on our top 10 editors' picks! 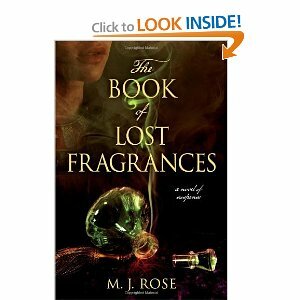 "Best Sellers in Books - Top 100 "
A sweeping and suspenseful tale of secrets, intrigue, and lovers separated by time, all connected through the mystical qualities of a perfume created in the days of Cleopatra--and lost for 2,000 years. Jac L'Etoile has always been haunted by the past, her memories infused with the exotic scents that she grew up surrounded by as the heir to a storied French perfume company. In order to flee the pain of those remembrances--and of her mother's suicide--she moved to America. Now, fourteen years later she and her brother have inherited the company along with it's financial problems. But when Robbie hints at an earth-shattering* discovery in the family archives and then suddenly goes missing--leaving a dead body in his wake--Jac is plunged into a world she thought she'd left behind. Back in Paris to investigate her brother's disappearance, Jac becomes haunted by the legend the House of L'Etoile has been espousing since 1799. Is there a scent that can unlock the mystery of reincarnation - or is it just another dream infused perfume? The Book of Lost Fragrances fuses history, passion, and suspense, moving from Cleopatra's Egypt and the terrors of revolutionary France to Tibet's battle with China and the glamour of modern-day Paris. Jac's quest for the ancient perfume someone is willing to kill for becomes the key to understanding her own troubled past. Click on the words above and scroll down to read more! *ALL these books ARE available via your choice of Kindle! Each month, Amazon.com's editorial team reads with an eye for the Best Books of the Month, plus the best books in popular categories like Cooking, Food & Wine books, Literature & Fiction, Children's books, Mystery & Thrillers, Comics & Graphic Novels, Romance, Science Fiction & Fantasy, the best books for teens, and more. We scour reviews and book news for tips on what the earliest readers have loved, we swap books amongst ourselves, and spend our nights and weekends tearing through as many of the best books as possible. Then we face off in a monthly Best Books Smackdown meeting to champion the books we think will resonate most with their readership. The titles that make our Best Books of Month lists are the keepers, the ones we couldn't forget. Many of our editorial picks for the best books are also customer favorites and bestsellers, but we strive to spotlight the best books you might not otherwise hear about. The books included in Amazon's Best Books of the Month program are entirely editorial selections. We have great passion for uniting readers of all ages and tastes with their next favorite read, helping our customers find terrific gifts for booklovers, and drawing more attention to the best books by exceptional authors of all stripes.